We all remember the scene in the movies where a prisoner is visited by a loved one or business associate and they kindly give them a cake to soften the hard walls of prison life. What we eventually learn is that inside the cake is hidden a file for the prisoner to attempt to break out of the penitentiary. These days, criminals, although not necessarily involved in high tech crime, are orchestrating criminal activities from within prison walls. Prisoners possessing cell phones while serving time is strictly against the law, but it’s almost impossible for law enforcement to stop the smuggling of devices. 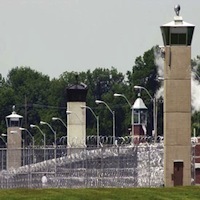 There are numerous ways prisoners get cell phones while incarcerated: They’ll purchase phones from unscrupulous guards, relatives pass them off during visits, and they even revert to old school tactics of throwing them over the fence. Phones are stuffed inside footballs or launched from a device called a potato cannon, which shoots the projectile through a pipe. They are even camouflaged as grass so prison guards are less likely to spot them on the ground. Once a felon has a smartphone they can then conduct their business just as if they were on the outside. With Internet access they can call up phone directories, maps and photographs to orchestrate crimes such as drug trafficking, gang violence or even hits on rival gang members. As mentioned, it is illegal for inmates to posses cellphones, yet thousands of them get into the US prison system annualy. In fact, in the first four months of 2010, the Federal Bureau of Prisons workers confiscated 1,188 cellphones, according to Senator Dianne Feinstein. 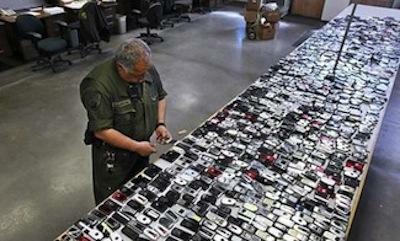 In California last year officers discovered nearly 9,000 phones. There has been much discussion as how to alleviate, if not eliminate the problem, none of which are ideal. The most logical idea set forth is to simply jam cellphone signals inside the prisons. There are two stumbling blocks in this solution, first, there is no way to limit the jamming to inside prison walls so any neighboring business or residents will also have their phones jammed. The second, and probably more important, is the legal aspects of jamming signals. “It’s illegal, plain and simple,” said Chris Guttman-McCabe, vice president of regulatory affairs for CTIA-The Wireless Association. He cited the Communications Act of 1934, which prohibits the blocking of radio signals — or, in this case, cellphone signals — from authorized users. It looks like the prison system in this country has a little more to worry about than a simple overcrowding issue. After getting the bad guys off the streets you would think we are safe from their antics until they hit parole, but they are just as dangerous inside the jailhouse walls when technology allows them to communicate with their “business partners”. How should the prison system deal with inmates sporting cellphones to carry out criminal activities while incarcerated? I know the TechnoBuffalo readers will come up with a solution.